Part 115: Haman. 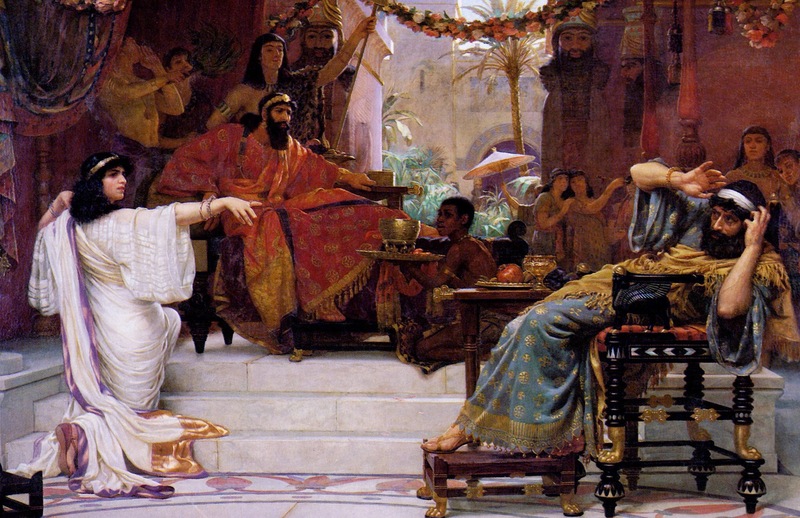 By now, I am sure, you are aware that Haman is the bad guy of the story in Esther. He was the one who plotted to have all the Jews killed and to have a special gallows built to hang Mordecai on. We also know, ultimately, that Haman’s plot backfired in the worst possible way, thanks to the faithfulness of Queen Esther to her people. She braved the possibility of being executed in order to do what was just and righteous. With that said, let us take a look at Haman anyway. It is easy to demonize someone as the “bad guy”, because it makes them something different than “us”. It allows us to place all of the blame on the evil “straw man”, as it were, and to avoid reflecting on ourselves and how we too fall prey to such tendencies. Haman, according to the Bible, was a descendent of Agag, who was king of the Amalekites. If you remember, the Amalekites were the people that King Saul and King David wiped out in certain areas. So, even in his family history, there is bad blood there. The Jews were the enemies of Haman’s ancestors. What’s more, it is also important to note that being an Agagite (a descendant of Agag) meant that Haman was NOT a Persian. He was yet a person who belonged to a land that had been conquered by Babylon and were now being ruled by Persia. Thus, Haman is a foreigner too. He, like Mordecai, had been promoted up the ranks to become an official in Persia. Not only was he an official, but he was the kings top official. He was the King’s right-hand man. So, given the history between the Jewish and the Amalekites, it is no wonder that Haman has a resentment against Mordecai and the other Jews. What’s more, when you add in the fact that Haman and Mordecai were both foreigners competing against each other for political positions, we get to understand the conflict. Piecing it together that way, makes sense of why Mordecai refused to bow and why Haman took such offense to it. Pride and tribalism seem to be at the heart of this conflict. There are other possible extra-biblical reasons as to why Mordecai refused to bow to Haman; however, given what we have to go on in Scripture, the obstinance that Mordecai showed Haman and the hatred that Haman had for Mordecai and his people, really begin to make sense. In our country today, we see such tribalism taking route in the form of hyper-nationalism. Dare I say this, the kind of nationalistic rhetoric I have heard thrown out there as of late sets America up as almost an idol to be worshiped. Beyond the national level, I have seen tribalism grow among the peoples within this nations. Republicans vs. Democrats, whites vs. blacks, citizens vs. undocumented immigrants, heterosexuals vs. LGTBQ, etc. Let us reflecton that. These divisions, these dichotomies are false in the eyes of God and they all lead us down the road toward destruction. Haman is a great and stark example of the destructive path that pride and tribalism lead us down. Let us begin to repent of the ways in which we have been falsely proud and tribalistic. Let us turn from our sins and run back into the arms of the One who created us all in the divine image. Lord, help me to steer clear of immoral and unholy tribalism and pride. Amen.